Our 10ft. Hi-Speed Screw Lock USB 2.0 device cables are designed and manufactured to be the BEST USB “A” to “B” cable your money can buy. USB 2.0 device failure WILL NOT be an option with these High Quality cables! Provides protection against accidental disconnect with screw lock attachment. Fully certified to USB 2.0 specifications. 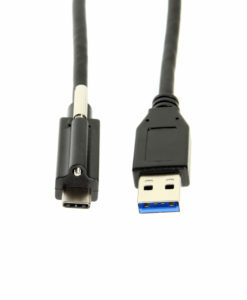 Devices are automatically configured through the USB cable once connected. Cable support Type-A Male to Type-B Male connections. When physically attached, USB 2.0 will allow computer peripheral devices to automatically configure without the need to reboot or run setup. USB 2.0 will also allow multiple devices – up to 127 – to run simultaneously on a computer, with peripherals such as monitors and keyboards acting as additional plug-in sites, or hubs. Our Screw Lock cables allow you to hook up these devices safely and securely. You’ll never have to worry about getting disconnected ever again!